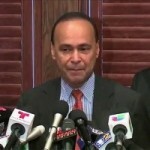 Illinois Democratic Congressmember Luis Gutiérrez announced Tuesday he will not seek re-election, because he instead plans to focus on rebuilding Puerto Rico in the wake of Hurricane Maria. This comes as the Federal Emergency Management Agency reportedly gave more than $30 million in contracts to a newly created Florida company called Bronze Star, LLC, which failed to deliver any aid to Puerto Rico. More than 40 graduate student walkouts are planned across the country today to protest a measure tucked into the budget bill that passed the House earlier this month that amounts to a pay cut of thousands of dollars for graduate students by reclassifying their tuition waivers as taxable income. Opponents say the move could diminish the number of students who will even consider graduate school and hurt the chances of finishing for current students. As NBC News fires Matt Lauer after accusations of “inappropriate sexual behavior,” guest Heather McGhee, president of Demos, makes the connection between patriarchy and abuses of power in media and government, from the White House and its endorsement of Alabama Senate candidate Roy Moore, to the GOP tax plan that Republicans are pushing toward a vote in the Senate. As Native American Heritage Month winds down, President Donald Trump is opening the door to new drilling and mining on land considered sacred by tribal nations. On Monday, Trump plans to travel to Utah to announce plans to shrink the Bears Ears and Grand Staircase-Escalante national monuments to make way for more industrial activity on the land. The Hopi, Navajo Nation, Ute Mountain Ute Tribe, Pueblo of Zuni and the Ute Indian Tribe all say they will sue to stop the plan. This comes after Trump attempted to insult Massachusetts Sen. Elizabeth Warren by referring to her as “Pocahontas” during a White House ceremony honoring Navajo code talkers, Native Americans who served in the Marines during WWII and used the Navajo language in order to transmit encoded information. Warren says her family is part Cherokee. Mary Kathryn Nagle is a citizen of Cherokee Nation and a partner at Pipestem Law, P.C., a law firm dedicated to the restoration of tribal sovereignty and jurisdiction. We look at the case of Olivia Lone Bear, yet another Native American woman who has gone missing in the oil fields of North Dakota. Her brother, Matthew Lone Bear, is part of a daily search to look for his sister since she went missing on October 25th in New Town, North Dakota. Olivia Lone Bear is the mother of five children.